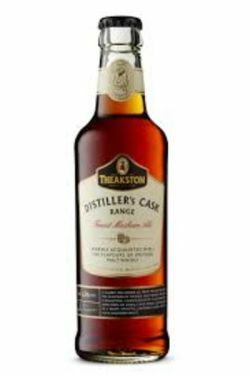 A classic, full-bodied ale from Theakston’s with the flavours of Speyside malt whisky creating a delightful, caramelised fruit flavoured beer, with hints of vanilla and honey, culminating in a warm, smooth, lingering finish. 330ml bottle (6.5%) at home on 4 Mar 2018, from Morrisons, Castlehill Road, Ayr: woody, vanilla, whisky aroma, amber, thin short-lived head, woody, malty flavour, little bit of vanilla, oily, woody finish. UPDATED: NOV 9, 2017 Smager af whiskey men meget lidt røg. Den har finde humle så en god nydeøl. 330ml bottle. Clear, chestnut colour with average to huge, thick, creamy, moderately lasting and lacing, off-white to beige head. Fruity, hoppy aroma, notes of red berries, cherry, woody, oaky background, a touch of vanilla, some toffee. Taste is slightly sweet malty, fruity hoppy and dry woody, hints of red berries, cherry, toffee, vanilla, oak; minimally watery for the style, its complexity and abv. Creamy texture, smooth and soft palate. Very nice. Clear golden with a very small head. Aroma is mostly caramel and malt. Some honey too. Taste is sweet. Bottle from a local supermarket. Pours quite clear chestnut brown colour with a good sized cream coloured head. Aroma is of sweet and delicate malt whiskey, toffee and bread. Pretty high level of sweetness, light bitterness. Towards heavy body, oily texture, average carbonation. Finish is dry with lasting toffee and whiskey edge. I’m not a whiskey fan but this was actually very good. 33cl bottle. Red/brown with small head. Aroma isn’t intensive. Yeasty dough, caramel, cooked red fruits, a bit of clove, brown sugar, dried apples and some flowery honey. Creamy mouth feel. The beer is dry on the fruit and dough side. Quite narrow in that matter. Not much bitterness, more of a lingering clove like acidity in the finish. Cooked fruits and spices that are watered down. Voila. Served in a snifter from a 330ml bottle. Pours clear red amber colour with a thick off-white head. Aroma is whisky, wood, caramel, apple, grass. Taste is caramel, whisky, malt and smoke. Medium body with medium carbonation. Excellent whisky infused beer with clear warming whisky notes all the way through. Look: copper reddish, white head with average retention. Aroma: oak, vanilla, malt. Taste: light malt sweetness with spicy bitterness and oak-like tannins. Body is alcoholic-dry. Flavour: oak, brandy, malt, apple pie. Dry boozy finish. Alcohol is very prominent for this ABV. Good however. 330ml bottle from Tesco. Mahogany color. Minimal head. Aroma of caramel, vanilla, whisky, oak. Taste is medium sweet with a wooded bitterness. Touch of light spice but unsure of its from the wood or the hops. The ale itself is definitely malt dominated. The aroma has a strong sweetness to It that suggests maybe honey or syrup added post fermentation. Very enjoyable.